TECO’s TK 9000 aquarium chiller, the newest product in the TECO Tank TK chiller range, is now available in the UK. This was designed to fill the gap between the TK 6000 aquarium chiller and the TK 5K commercial chiller. The TK 9000 has approximately 50% more cooling capacity than the TK 6000, but uses the same footprint as the TK 6000. This is achieved with a larger compressor, larger condenser, and larger exchanger. 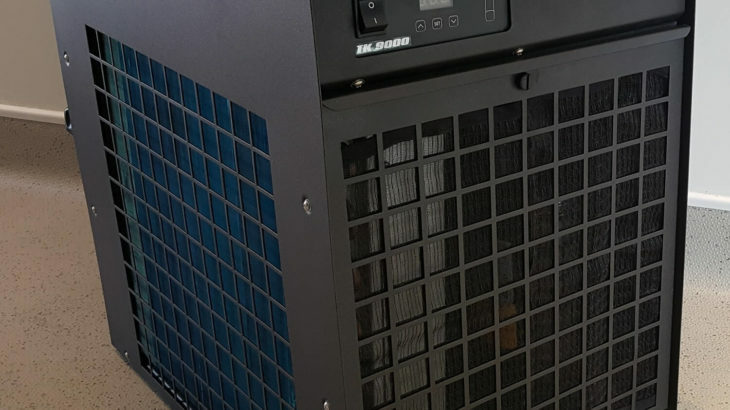 For those of you who are familiar with the TECO range of aquarium chillers, you will see that although the frame is the same size as the TK 6000, the exhaust grill protecting the condenser is approximately 30% larger. For aquarium use, this will maintain a system of up to 9,000 litres at up to 25 degrees Celsius. The photo shows the prototype, but this product is now available from stock, and an ‘official’ photo will appear on our product page in due course. If you have any questions or would like more information about the product, please do not hesitate to contact us.